Twenty minutes into my decidedly finite thirty-three hours with Infinite Adventures, I messaged a friend and mentioned how similar this game is to Etrian Odyssey. Twenty hours in, my opinion hadn’t changed. 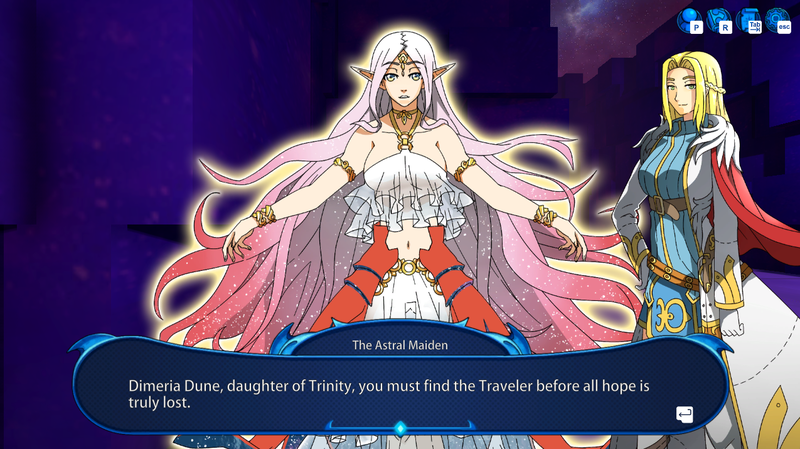 While perhaps not as polished as that established series, Infinite Adventures does just a little to set itself apart from one of its sources of inspiration, and that’s not a bad thing at all. As the debut title from Charleston, South Carolina-based independent game developer Stormseeker Games, Infinite Adventures does boast an impressive narrative, excellent voice acting, and robust gameplay. Infinite Adventures begins with the player taking on the role of the Traveler, found passed out in a mysterious labyrinth beneath the town of Giamata. Eventually the Traveler awakens and is somewhat grudgingly allowed/sent back into the labyrinth with a party of adventurers to figure out its mysteries as well as his relationship with it and its inhabitants. Other NPCs are encountered throughout the journey through six regions of four floors each, some becoming steadfast allies and summons, others becoming enemies needing to be dealt with. Like most dungeon crawlers, there exists just a single city from where all adventuring takes place with a guild hall, an inn, a one-stop shop for anything money can buy, a church, a tavern to accept sidequests, and a meeting hall for town nobility. The story of Infinite Adventures begins simply enough. There’s a mystery behind who the Traveler is, and while that unfolds throughout the game and remains paramount, there is so much more going on. The nobility of Giamata are quite a bit involved in the Traveler’s adventure, sometimes joining the party temporarily, sometimes permanently, sometimes dying, and sometimes very annoyingly dying after they’ve become permanent party fixtures. While there are no more than a handful of fateful decisions the Traveler has to make throughout the game, there are some that are important enough to add or remove NPCs and party members permanently and even change the reality of the game world. With a history dating back millennia, and fully voiced lines telling of heroes and battles past, the game world and its political climate becomes quite immersive and fleshed out as players progress through the story. For the majority of the game, the exploration and story provides far more plot questions than answers, but does enough to offer extra motivation for players to discover the answers, on top of the enjoyment that the robust combat system provides. The Astral Maiden guides the Traveler through the labyrinth, showing up at important story junctures. Navigating the labyrinth is almost a standard dungeon crawler affair, but having upgradable party abilities to find secret passageways or open locked doors occasionally freshens up the standard formula. Players travel through a grid-based labyrinth, moving through mainly tight corridors and the occasional open area. The game unfortunately does contain an annoying amount of doors requiring the push of a button to open, but otherwise has no other issues. Everything in the labyrinth is viewed from a first-person perspective; there are some stronger Yokai monsters that appear as glowing spots that don’t move, but most battles are random encounters, with a lighted sigil warning when encounters are close to taking place. Combat is definitely one area in which Infinite Adventures stands out. While party members can attack using standard melee weapons from the front row and ranged weapons from the back, regular attacks become decreasingly effective the further the game progresses. Mastering new abilities by spending skill points and employing them effectively in battle helps a great deal. One neat aspect of Infinite Adventures is that various character classes employ different methods of activating their special skills in battle. Some, like the Mendicant and Soul Caller, have a standard pool of mana points to cast spells. Others, like the Warlord and Stormseeker, have rage or astral energy pools that begin at zero, but fill based on actions performed in battle. Still others, like the Ronin or Archeologist classes, have a focus pool that starts each battle at a max of fifty, but can regenerate every round once a skill has been used. This adds a layer of interesting strategy and complexity to the battle system. 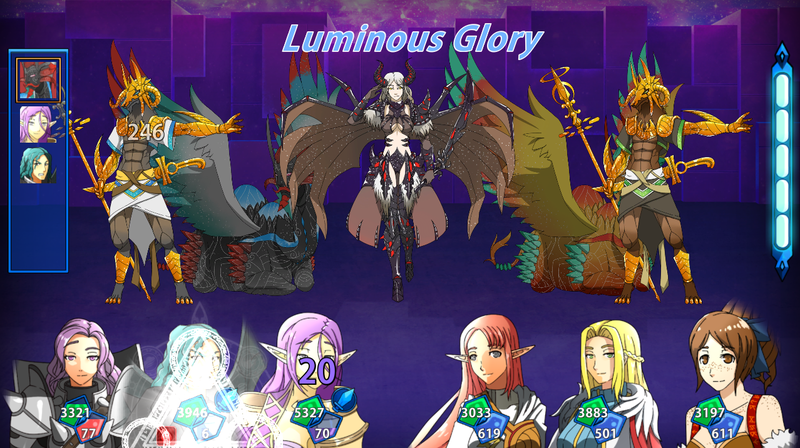 In addition to regular attacks and skills, there are whole party attacks called kessens, as well as buffs and summons, that use an empower gauge that slowly fills on the side of the battle screen. Unfortunately, while kessens and summons seem like a good idea for a while, regular character abilities seem to surpass their effectiveness from about the mid-game on. At this point, it becomes more worthwhile to use the gauge in order to power up individual attacks or spells. Powering up spells is not just something that can be done via the empower gauge; most spells can have their area of effect changed with the press of a button. For an increased MP cost, a single-target fire spell can easily be changed to one that hits a whole row or all enemies. The same can be done with healing spells and buffs, allowing full-row and full-party effectiveness from the beginning of the game. Parties of six adventurers: three up front, three in the back. Infinite Adventures is filled with a great deal of features that make this dungeon crawler experience more welcoming than many other entries in the genre. While the difficulty level is fixed after it’s chosen at the very beginning of the game, and getting a full party wipe means being forced to reload a previous save, almost everything else seems designed with the player in mind. While players can make their own party members in a deeply complex character creator, there already exists a well-balanced party waiting for the Traveler to adventure with right from the start. Similar to many dungeon crawlers, money is mainly earned from selling items collected in the labyrinth, and with an unlimited inventory system, long collection runs can be quite profitable. Encounter rates can be manipulated on the fly from zero encounters to double the normal rate depending on if exploration or grinding is the goal. Optional sidequests can be accepted from the local tavern, and for the first half of the game are easily completed just by walking through new floors, with little to no backtracking or searching required. While that changes in later floors, it’s a great introduction to the sidequest system. Finally, decisions on skill point allocation for characters don’t have to be stressful. For a quite nominal fee, all skill points can be reset, allowing for character customization any time the party returns to Giamata. While many features work out great, the one implied by the title falls a little flat. The name Infinite Adventures partially comes from the wild portals accessible in the town’s library. The main 24 floors of the game’s labyrinth are set in stone, but wild portals to procedurally-generated smaller areas open up throughout the game, which can be explored endlessly. These areas are around a quarter of the size of a regular labyrinth floor, but take forever to navigate as they’re mainly tiny, empty rooms connected by a ridiculous amount of doors. There’s a free treasure chest or two on each floor, but the spoils from these are almost never worth the time or effort needed to obtain them. With the ability to turn random encounters off, these wild portals and free spoils are incredibly easy to exploit, but frustrating enough navigation-wise to want to avoid. 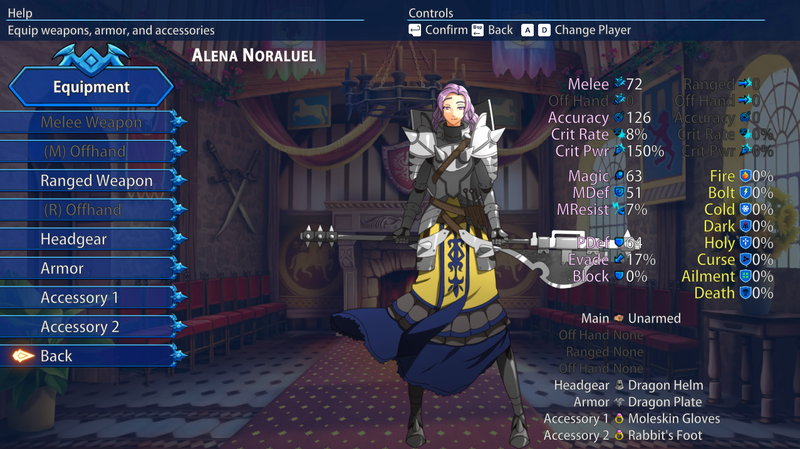 Plenty of equipment slots for weapons, defense, and accessories. While the music of Infinite Adventures is pleasing and varied enough to be considered of average RPG quality, some tracks will grow old long before the game’s end due to sheer repetition. The score is well-matched to the settings of the various levels of the labyrinth, but when a level takes five hours to complete, the same song on repeat for the entirety of that level doesn’t hold up. What never once grew old though was the voice acting. Wherever Stormseeker Games encountered this cast, they should be on speed-dial for whatever game is next up for this new studio. The actors seem earnest in delivering their lines, and although some of the accents may seem a bit forced, the sheer number of voiced parts makes that a bit understandable and also commendable as everything is voiced. From the briefest encounter in the labyrinth to each and every sidequest request to the most important of story scenes, hearing it all was a treat, particularly in an indie game where voice acting is far from the expectation. Graphically, a similar dichotomy exists as there does in the music. The background visuals received the most detail and shading, while the character and monster sprites were left a little bit behind. Whether walking through the labyrinth or stepping into the various buildings in town, the scenery features a high level of attention to detail. Sadly, the wide variety of NPCs and monsters didn’t get the same treatment. While they are well-designed, the coloring seems a little too bright and the shading and small details not quite enough there to match the style of the backgrounds. They’re also 100% static, with no change in facial expression or posing in town or in battle no matter what’s taking place. It’s an effect similar to old animated cartoons, where moving characters or objects don’t quite visually match with the static background image. Overall the graphics are a strong point, but matching foreground with background styles a little more and animating the sprites could boost great graphics to amazing ones. While I fully admit to being a huge Etrian Odyssey fan, other dungeon crawlers throughout the years haven’t always done it for me due to either bland attack-attack-heal combat systems or high levels of difficulty. Infinite Adventures seems to capture the spirit of an Etrian Odyssey story and gameplay in an experience about half the length and with more quality-of-life enhancements than any entry in the long-running series. While it’s not as polished in its graphics, it’s an enjoyable game that’s more accessible to newer fans of the genre, yet with deep enough combat systems and a difficulty slider that might make the dungeon crawler expert take notice as well. Stormseeker Games has put forth a strong debut title and will be worth keeping an eye on from this point forward.